“For a considerable portion of humanity today, it is possible and indeed likely that one’s neighbour, one’s colleague, or one’s employer will have a different mother tongue, eat different food, and follow a different religion than oneself. It is a matter of great urgency, therefore, that we find ways to cooperate with one another in a spirit of mutual acceptance and respect,” writes Nobel Peace laureate Tenzin Gyatso in his recent book Beyond Religion: Ethics for a Whole World. 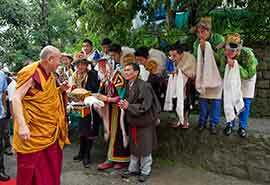 This Tibetan Buddhist leader, popularly known as His Holiness the fourteenth Dalai Lama, travels around the world, emphasizing the necessity for all human beings to engage in the practice of ‘secular ethics’, by which he means a concern for the well-being of others, compassion, kindness, patience, forgiveness and generosity. He has been advocating an approach to ethics which is grounded in these universal values, and not in religion, so that it can make sense to people of all faiths and those that choose to embrace none. According to him, the factors that divide us from each other are quite superficial when we remember the two most important things we all share – our quest for happiness, and our wish to eliminate suffering. I had the opportunity to listen to him speak at the Tibetan Children’s Village in Upper Dharamsala, Himachal Pradesh on June 27, 2013. 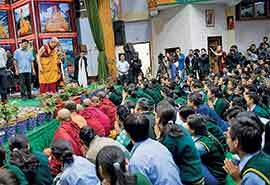 He was addressing a large audience, primarily made up of school-going Tibetan children and Tibetan college students who had come from various parts of India. Highlighting the importance of cultivating the wish to benefit all beings and working to end their suffering, he spoke about how children are more alive to love and compassion but as they grow up, the education system works against these values that are inherent in their being. According to him, today’s education system focuses almost exclusively on maximizing material development and fosters unhealthy competition. In this kind of environment, love and compassion do not have an opportunity to be nurtured and developed. At another set of teachings in Dharamsala from June 1 to 4, 2013, he spoke about how when little children play, they do not think of which caste, religion or community they or others belong to. They just play. However, as they grow older, their minds get filled up with differences. While I find this true to a certain extent, it appears that these days, even little children are not spared. Some I have interacted with are acutely conscious of belonging to a particular religious community, of their being ‘vegetarian’ and others being ‘non-vegetarian’, of the idea that non-vegetarian people are, by nature, cruel given the food they eat, and of other divisive factors. Their parents see this as a way of building a strongly grounded identity but fail to understand the harm caused by sowing these seeds of ‘us’ versus ‘them’. In such a context, what is the role that educators can play? Of late, the Dalai Lama has been speaking in various public forums about how religion no longer has the influence it used to have in society, and that family values which used to be grounded in religious faith and nurtured within strong community identities have also been eroded due to materialistic values and economic pressures. Instead of bemoaning the situation, he has been suggesting that institutions such as schools take up the responsibility of inculcating inner values in a serious way. I found it refreshing to come across a spiritual leader who is open to learning from the best of what other religions have to offer, and who also says that one does not need to be a follower of any religion in order to practice the highest human values. This could sound scary to teachers, who already feel weighed down by the millions of expectations piled on them – from students, colleagues, school administrators, parents, their families, and of course themselves. However, if what needs to be done needs to be done, how do we go about this? The Dalai Lama acknowledges the difficulties involved, especially in schools that have children from diverse religious or cultural backgrounds. He writes, “To use a single religious perspective would be inadequate… How can schools give their pupils an ethical education which is unbiased and inclusive?…. What is required is a way of promoting inner values which is genuinely universal – which can embrace, without prejudice, both agnostic humanist perspectives and religious perspectives of various kinds.” It might be useful to hold discussions around these ideas in the schools we are part of, to seek deeper ways of cultivating inter-cultural understanding in our environments than satisfying ourselves with token celebration of festivals or including a variety of prayers in the morning assembly. The Dalai Lama’s teachings may not directly inform the development of a syllabus but it seems useful to bear in mind what he has to offer in terms of a simple pedagogical recommendation. He lays emphasis on teaching by example. In his view, it is not beneficial to merely ‘tell’ students why they need to integrate a particular value into their life; they need to ‘see’ their teachers doing it and then build the motivation to emulate it. He writes, “If teachers talk about the value of kindness, elaborating its benefits, while failing to illustrate what they are saying through personal example, then students are unlikely to find their words compelling. If, on the other hand, teachers embody kindness in their own behaviour by showing genuine concern for their students, they will make their point more effectively.” Of course, that is easier said than done. A commitment to this approach will require teachers to be brutally honest and vulnerable, and to invest a lot of time and energy in their work. However, it will also offer them a chance to transform themselves, to truly be what they expect their students to be. This sounds utterly demanding but comes with a huge reward. In the aforementioned book, the Dalai Lama remarks, “I am aware that teachers in modern societies often face tremendous challenges. Classes can be very large, the subjects taught can be very complex, and discipline can be difficult to maintain…. Teachers must be applauded for choosing this career. They should congratulate themselves, particularly on days when they are exhausted and downhearted. They are engaged in work that will influence not just students’ immediate level of knowledge but their entire lives, and thereby they have the potential to contribute to the future of humanity itself.” Now that is some precious encouragement to save for those difficult days that all teachers have. The author was selected by the Delhi-based Foundation for Universal Responsibility to participate in Gurukul 2013, a five-week immersion programme in Dharamsala, Himachal Pradesh to learn about the life and culture of Tibetans in exile, Buddhist philosophy and the Tibetan struggle for independence from Chinese occupation. He can be reached at chintan.backups@gmail.com.